This dark rich lavender chocolate goose egg cake is made with a single egg. You can, of course substitute the goose egg with chicken eggs, but it’s well worth trying to get hold of one if you can. The cake is filled and covered with an unctuous chocolate ganache which is also flavoured with lavender. Ideal as a Mother’s Day cake and probably best enjoyed by adults. If I’m around, I always endeavour to make a cake for my wonderful mother on Mothering Sunday. The question this year was, what cake to make? Simnel cake is traditional for this Christian festival which falls on the fourth Sunday in Lent. It was a day’s reprieve from the Lenten fast and domestic servants were given the day off to visit their mother church. This meant they were able to spend time with their families and specifically their mothers. These days Simnel cake is more closely associated with Easter, but the old tradition of baking a cake and picking flowers for our mothers lives on. With spring in the air, a cake with a floral theme seemed appropriate. I happened to have some lavender chocolate in the house and remembered the success of my chocolate lavender cake. Although lavender isn’t exactly spring like, it is floral. So a lavender chocolate cake it was going to be. Excitingly, it’s the season for goose eggs and I had bought one especially to make my Mother’s Day cake. Goose eggs have a very short season, so I pounce upon them with glee whenever I see them in the spring. They’re very large and have a whopping yolk, so are excellent for baking. They roughly equate to three large hens eggs. 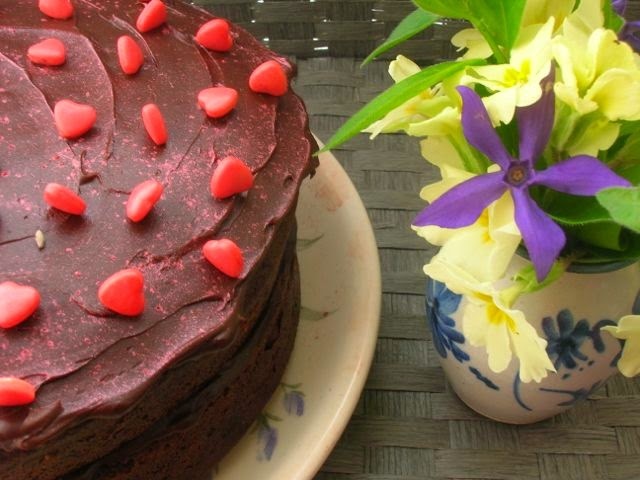 I scattered the lavender chocolate goose egg cake with edible red dust, pink hearts and lavender flowers. Sadly most of the flowers all blew off in the wind when I took the cake outside to photograph it, but I reckon the hearts say it all anyway. I made it yesterday and I’m off to deliver it later this afternoon, along with a bunch of primroses and a card. The chocolate goose egg cake was sensational. I was really pleased with it and more to the point so was my mother. The lavender flavour was good without being overpowering and the cake was beautifully light. Thanks for visiting Tin and Thyme. If you make this deliciously floral lavender chocolate goose egg cake, I’d love to hear about it in the comments below or via social media. Do share photos on your preferred social media site and use the hashtag #tinandthyme, so I can spot them. For more delicious and nutritious recipes, follow me on Twitter, Facebook, Instagram or Pinterest. A dark rich chocolate cake flavoured with lavender and then filled and covered with a dark rich ganache also flavoured with lavender. Place the lavender in a covered pan with the water and bring to the boil. Leave to steep for an hour, then strain. Cream the butter, sugar and salt until light and fluffy. Beat in the cocoa, followed by the egg. Sift in the flour, baking powders and almonds and stir in alternately with the lavender water. Stir in the yogurt until just incorporated. Divide the mixture between two 8″ round silicone cake moulds and bake at 180℃ for 25 minutes. Leave to cool in the moulds for 10 minutes, then turn out onto a wire rack to cool completely. Melt the chocolate, butter and honey in a pan over very low heat until just melted. Remove from the heat, then stir in the cold cream. Use half of the ganache to sandwich the two cakes together then spread the remainder over the top cake. 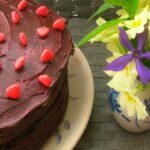 I am sharing this Lavender chocolate goose egg cake with Emily at A Mummy Too for #recipeoftheweek. I have never baked with goose egg….the cake looks intriguing and beautiful! I have lots of lavender growing in the summer months but never used it before to cook with. Now I will give it a go. I’m intrigued by your decision to use a goose egg! I’ve never cooked with them, but when I see them I always imagine a gigantic poached egg, rather than as something to use in baking 🙂 And lavender, mmmm, I love lavender in cakes. I did make simnel cake for my mother-in-law, but it sank a bit (new recipe!) so that one won’t be getting blogged until I figure out what went wrong. OH how pretty is that cake and with goose eggs too! Lovely and I bet your mum enjoyed it too! This is a very pretty cake, including the little hearts on top. I have never seen a goose egg before and now really want to. They must be huge. Hope you and your mum had a lovely day. Oh this really inspires me! Your mum is lucky to have a daughter who bakes so many yummy chocolate treats! I am intrigued about lavender chocolate. I have never tried it. This looks, and sounds, so gorgeous. 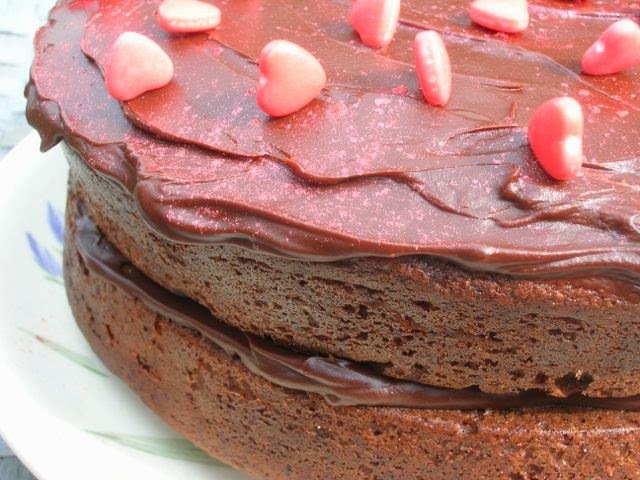 Lavender chocolate cake, mmmmmmm…. Lush, lush, Lush cake. I would love to cook some more with lavender. I know your mom was so pleased! What a beautiful cake! That looks so good. I bet it tasted great too. Simply beautiful! 🙂 Next year I might have to hire you to make me a mother’s day cake! At least then *I* won’t have to make it & I could still get edible cake for Mother’s Day! Win! That sounds absolutely gorgeous. I really look forward to goose egg season every year. They are really good for baking but I tend to eat most of them before they get that far.